If you own a vessel, then you understand the importance of clearing away barnacles and algae that form on the sides and bottom of your vessel. Over time, barnacles can actually cause your boat to slow down and waste gas due to extra weight and drag on the water. Cleaning barnacles with water blasting is a good way to give you boat a thorough cleaning. If your vessel is in the water for extended periods of time, investing in a quality water blaster is worth the investment. When looking for a water blaster, you should keep in mind the following: getting a good balance between the psi (pounds per square inch) and the gpm (gallons per minute). Both refer to the water pressure and the amount of water being used. While most people tend to buy water blasters with a higher psi, if the gpm isn’t high enough, the debris that is loosened will not be washed away as easily. For cleaning barnacles with water blasters, buy one with at least 10,000psi and make sure the gpm is comparable. Investing in a durable cleaning brush, extra hose, and the right chemicals are essential when cleaning barnacles with water blasters. The right cleaning brush can help loosen barnacles and other debris while the pressurized water will help remove them from the surface. Depending on the size of your vessel, you may need to buy extra hose in order to be able to reach smaller places on the boat. Cleaning barnacles with water blasters cannot be done without the right chemicals. Chemicals that help dissolve barnacles, algae, and other plant life are recommended. Once of the last items to consider when buying a water blaster is the temperature of the water. Cleaning barnacles with water blasters using either hot or cold water should be adequate, but if you plan on using cold water you will need a higher psi rating. When it is time to wash your vessel, begin by using the brush and cleaning chemicals to loosen debris and other items from the sides and bottom of your boat. After thoroughly washing the surface, you can remove the brush and power wash what remains. Cleaning barnacles with water blasters is a quick and easy way to clean your boat. 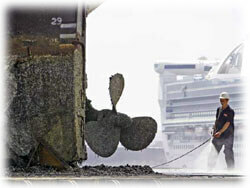 Pressure washing every 9 or 10 months should be enough to maintain your vessel.